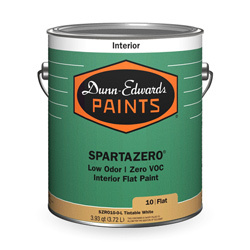 SPARTAWALL® is a complete line of premium, ultra-low VOC, interior acrylic paints. It is formulated to provide a tough, durable, block resistant finish that is easy to apply. SPARTAWALL® is ideally suited for use on commercial and residential projects, such as schools, hotels, hospitals, and single family or multi-tenant housing. 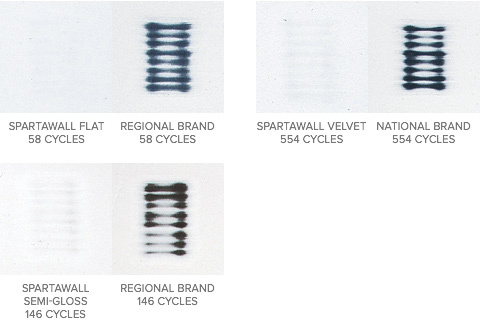 SPARTAWALL® outperforms other brands in durability after repeated scrub cycles. That means the painted surface will maintain its original appearance longer. Paints are applied to black charts. After drying for seven days, the charts are placed in an abrasion testing machine and stopped at the indicated cycle. Complete film deterioration occurs when a full line of black background is exposed. SPARTAWALL® has better block resistance compared to competitive products of the same gloss level. Good block resistance helps prevent a door or window from sticking to the door jamb or window frame after they are painted. Paints are applied to black and white charts and allowed to dry for 24 hours. The charts are then folded over each other. A weight is then placed on them to force the painted surfaces together. 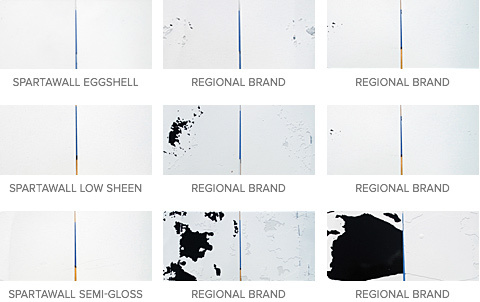 After 24 hours, the face-to-face charts are pulled apart to see if the dried paint stuck together. It is always recommended that SPARTAWALL® be used over properly prepared and primed surfaces.